A marketing plan, much like a road trip, has three basic sections: (1) the objective – where are we going or our “destination”, (2) the strategies – what route are we going to take to get there, and (3) the specific tactics – what vehicle will we drive. Oh, and as a bonus during the strategy section, we may want to consider alternate routes in case there is traffic or road blocks. What happens during the course of writing a branded marketing plan is the magic of it. It’s the joy of the journey and the most fun part! A well-crafted marketing plan is written in collaboration with people across the business and forces conversations on meaty, strategic topics. It forces teams to recognize trade-offs and align on priorities. So, the real beauty of the marketing plan lies not just in the plan itself but also the process of getting there (that’s the Road-trip part!). 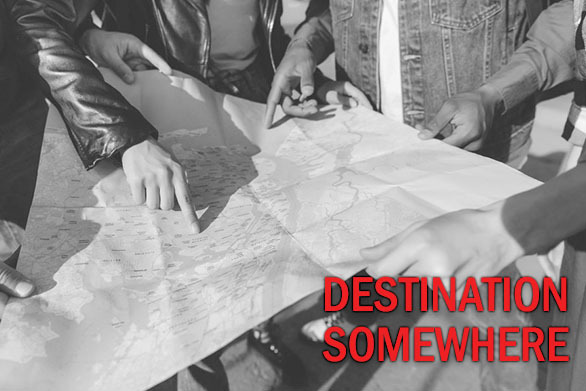 I want to share my approach to this journey, so you and your teams can achieve marketing magic – a clearly articulated destination and a plan of how to get there with everyone in the car with you. Journey Leg #1 – Where To? Setting clear objectives can often feel esoteric. “Grow the business” – “Get new users” – “Drive Traffic”. Yes, these are all objectives, but they can feel overwhelming and as they are, they don’t really help the team understand what to do or how they can contribute. It’s like telling someone to “just drive south” without telling them how far or what the fastest route might be. I find the best way to set objectives is to break it down… then break it down again. If your objective is to grow 5% in revenue, break it down into dollars, then break it down by quarter, then potential products and channels, etc. You get the idea. The more specific the objective, the easier it will be to develop compelling marketing and sales initiatives! Align as a team on the break down so everyone agrees and is headed to the same place. Journey Leg #2 – Who Cares? Now that we are grounded in our objective, who is buying? Set aside, for a minute, who we are selling to today, who do we want to sell to? Sometimes the person who is buying from you today might not be the one buying tomorrow. Or maybe there are new growth opportunities by re-framing who you are selling to. Never do this at the expense of your current customer or buyer but be as aspirational as possible in order to grow. And keep it simple with a sentence like “For people who look like this and act like that and need this…”. Journey Leg #3 – Why You? Now, the most critical conversation of all. Why choose you? What are the areas where you stand out from competition and win? To answer that question, you need to understand the competitors and what they are great at. There may be some areas where being at parity with the competition is ok and you have to nail the basics. But there should be areas where you are differentiated and the clear choice. It’s those reasons why people would choose to spend a dollar with you versus other options. Those are the things that stand out and where you have the capability to shine. This is the cornerstone of your communication strategy. It tells you what to talk about. Journey Leg #4 – Why Not? The most fun and magical part of the process are the initiatives and ideas that bring your strategy to life. What are the specific action items that we can start doing to implement our strategy? Be sure the tactics are going to help achieve the objective from “where to”. Don’t get distracted by ideas, recommendations or suggestions that aren’t focused on your goal…it’s just a distraction? This will likely require trade-offs. Estimate the value of each idea and build them into your plan. Make sure your total estimates exceed your goals. Everything you do may not work, so build in room to experiment. Journey Leg #5 – Well Done! The last leg of our journey is all about knowing when we are there. How do we know if we are successful? As you define your tactics think about how you will measure the success of that effort against the objectives you’ve aligned to. Measure often and don’t wait too long to adjust if something is not working. There are always alternate routes. Oh, and one last, important note. Make sure to celebrate achievements along the way. It will make the journey all the more magical. At The Marketing Posse we thrive on helping companies create marketing magic. If you need help getting started or navigating the planning process, please reach out. We are here for you! The fall season is a great time of year for teams to have this dialogue and to create solid plans for the next year.